The beauty and cosmetics market is extremely competitive, with hundreds of different brands jostling for attention. Establishing a brand’s point of difference is crucial, and this is where tone of voice plays an important role. The people behind delilah, a new capsule cosmetics collection, asked me to create a tone of voice to help the brand stand out in the marketplace. We got together at their headquarters in Marlow and I held a brainstorming session where we discussed the range, the delilah customer and what makes the brand distinctive. I came up with the brand’s tagline – ‘distinctively different’ – and wrote a set of tone of voice guidelines that established a specific territory for delilah as uncomplicated, luxurious and inspiring. The team used these guidelines as starting points for the copy in brand presentations and on their website. 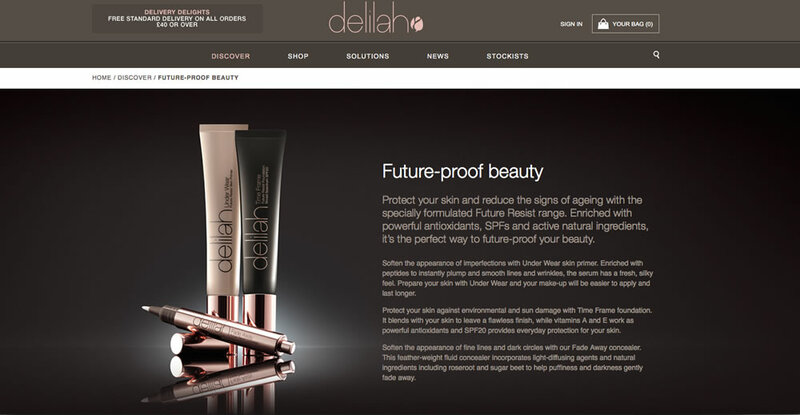 delilah has been extraordinarily successful, gaining plaudits from Vogue and The Sunday Times Style magazine, as well as winning Best New Brand in 2016 at the CEW beauty industry awards.